We often hear about how our sedentary jobs are going to kill us from inactivity, but one profession that has the opposite problem is nursing. I was recently asked by a reporter if she had any specific exercise advice for nurses. I thought I’d share it with you here. Any of this advice applies equally to restaurant workers, delivery people, or anyone else whose job keeps them on their feet all day. If you know anyone like that, by all means share this post with them! Stand up straight with your head level. Place one hand behind your back as if standing “at ease”, only with the back of your hand on your lower back. Put the other hand on top of your head, and gently pull your head to the side until you feel a stretch. You should feel the stretch in your neck, shoulder, and a little bit in your core. Hold for 20 seconds, then do the other side. Do this once an hour to help keep your neck muscles loose and balanced. Stand up straight with good posture. Put your hands out to your side, and rotate your hands so your thumb is pointing backward until they’re pointing at the wall behind you. Press your shoulder blades together, and hold for five seconds. If you do this once an hour, it will help prevent back, shoulder, and neck pain caused by constantly leaning over your patients and looking down at their charts. Put your hands on your hips and slowly swivel them around like a hula-hooper. Do this five times per side every hour. It will help keep your hip and back muscles stable and balanced, preventing low-back pain. Attach some exercise tubing (just medical tubing with some grips on it) to a coat hook or something else relatively close to eye level on the wall. Holding your hands thumb-side up and your arms straight out in front of you, pull your elbows straight back toward the wall behind you. Do three sets of three reps 12-15 times, at least three times per week. Walk backwards and sideways at least 10-15 feet a few times each day. Believe it or not, this will help you stay balanced and prevent injury, as you’re periodically recruiting muscles that you don’t normally use. Bench presses, bicep curls, leg presses, leg extensions, and sit-ups on the floor. All these traditional exercises promote over-development of some muscles and the under-development of others. These muscle imbalances can put you at risk for injury, and they don’t promote the kind of stable, pain-free body you need to do your job. Check me out on Youtube! Don’t forget to subscribe. By now we’ve all heard the studies: sitting is killing us. 45% of women and 37% of men spend less than 30 minutes per day on their feet while at work. Out of all the people who responded to a British survey about the matter, 80% of people thought that they sat too much. So, you probably know the risks of being sedentary: hypertension, diabetes, weight gain, some cancers. Even knowing the risks, it turns out, doesn’t make most people get up and move. So how about let’s focus on the benefits, eh? Everyone has periods of low energy on the job, but rather than reaching for coffee or Red Bull, but studies have shown that even short exercise like a walk around the building can be more effective (not to mention healthier) than caffeine for energizing you. Need to come up with an idea for a presentation? A Stanford study found that going for a walk (especially outside) can boost creative output by 60%. Chair squats: keeping your spine straight, hands either on your hips or out in front of you, sit on a chair (a kitchen-type chair is best) and stand back up without using your hands. 3 sets of 6 to 10 of these. Lunges: 3 sets of 6 to 10. Balance: hold one leg up for 20 seconds each leg. March in place: 3 times for 60 seconds. To develop even better balance, try the previous two items with your eyes closed. Arm circles: 10 seconds forward, 10 backward, 3 times. Stretch your hand by pulling back on your fingers one by one. This will prevent carpal tunnel and trigger-finger repetitive motion injuries. Walk forwards, backward, and sideways back and forth to create balance in your legs and prevent injury. Use tubing for back pulls–anchor the tubing around a door handle, and hold on to the grips. Standing with feet shoulder width apart, pull both elbows back in a rowing motion, pulling your shoulder bladed together. This is just a start. There are many small exercises that you can do to stay moving at the office. Even a couple of minutes per hour is enough to see significant benefits. If you found this information helpful, please share! Last week, we talked a little bit about TPI golf fitness assessments and how they can predict your specific golfing abilities and weaknesses. This week, I want to show you one of these assessments and talk a little bit about corrective exercise. The objective here is to test the mobility of your hips and lumbar spine, and your ability to control the position of the pelvic posture. The ability to move and control the position of the pelvis is important for optimizing power transfer from your lower body to your upper body during the golf swing. Get down on your hands and knees with your thighs and arms perpendicular to the floor. Without bending your elbows, try to bend your spine so that your stomach gets closer to the floor, making yourself sway-backed like a dog. Then, lift your spine up into an arch, like a cat. Repeat this back and forth and then find the middle or neutral position. Hold this neutral position for two breaths. Lie flat on your back with your knees bent and your feet flat on the floor. Try to tilt the pelvis back and forth (arch the back and flatten the back), trying to simultaneously limit any chest or upper body movement. Make sure when flattening the back, the abdominals are braced. For a right-handed player, stand facing the mirror. Cross your hands across your chest like I do in the video. Get into a good golf posture. Rotate the shoulders in a clockwise direction and resist hip rotation. Reach maximum rotation but don’t force a stretch. Hold the position for one second. Rotate the shoulders back to neutral position. These are just a few exercises you can do to increase pelvic mobility. It’s important not only to do this on your own, but also to have a TPI certified trainer help you with them. There are some posture quirks that this test can reveal to the trained eye, and we can get much more specific in terms of what can be corrected. I always try to keep up with the latest knowledge available to fitness professionals. This past week, I traveled across the country to upgrade my knowledge and check out the cutting edge of golf fitness. I visited golf’s premiere trade show, the PGA Merchandise Show in Orlando, Florida. While I was there, I attended a TPI fitness professional certification class in order to keep my knowledge fresh. 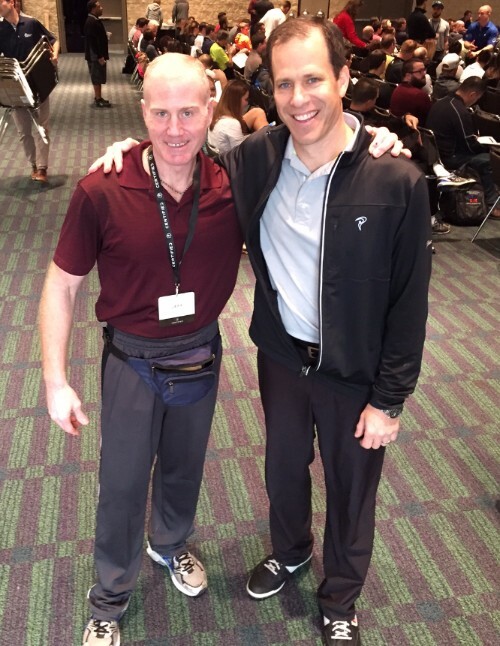 When I first got my TPI certification, I was one of only 4,000 TPI-certified golf fitness pros in the world. Now there are more than 18,000 of us. It’s become the standard in golf fitness. Touring golf pros travel with an entourage of experts, from swing coaches to doctors to nannies. Nowadays, 23 of the top 30 tour players travel with a TPI fitness pro. 16 of the last 18 major tournament winners have a TPI pro in their stable. The job of the TPI fitness pro is to assess the body as a continuous chain of kinetic energy. TPI’s philosophy is that every there isn’t one perfect way to swing a club, but there is one correct way for each golfer, and that is determined by the golfer’s body and how it moves most efficiently. To achieve an efficient swing, a golfer has to be screened by a TPI pro, who can give a detailed assessment of biomechanics, physical fitness, movement quality, current health, and history. In Orlando, I was able to refine my assessment techniques. Because the body is an interconnected system, some of the techniques are not that obvious. For example, if you cannot perform a squat with good form, you will most likely have a swing fault called “reverse spine angle.” By observing and correcting subtle links between your mobility and your golf game, I can consistently improve your score. Once we’ve completed the screening, we’ll use the results to create a unique plan for you, including fitness training, corrective exercise, stretches, and movement patterns.